HomeFeaturesFEATURE: 15 unreleased albums that we may never, ever hear! Sometimes bands write and record a full album and then, at the last minute, they decide that they just don’t want to release it. They shelve it, it collects mounds of dust for a number of years, and sometimes it never sees anything more of the world than that. There’s a number of reasons why bands and artists decide to lock away a full record from the public. Either they have other commitments that take priority, they’re unhappy with the end product and want to try something different, or even a tragedy befalls them. It even can be something as simple as a change of heart. Whilst for the most part we never know about albums that’ll never see the light of day, some unreleased and shelved (or, as you may prefer to call them, lost) albums are publicly documented and, unsurprisingly, die-hard fans are eager for it to leak or for their idols to change their minds and put it out there for them to hear. We’re taking a look at just 15 of these records that (at least at the time of writing) were known to exist in some capacity, but are yet to be officially released in one way or another to the world. The boys in Blink-182 have their fair share of side-projects nowadays, don’t they? During their hiatus between 2005 and 2009, bassist/vocalist Mark Hoppus and drummer Travis Barker got to work with another project together pretty quickly. Completed by guitarists Shane Gallagher and Craig Fairbaugh, the four-piece quickly released their debut and currently only studio album, ‘When Your Heart Starts Beating’. Entering the #10 spot on the Billboard 200 and boosted with worldwide tour, it was a big success, though sadly it was short lived. In 2007, they began working on its follow-up, though apparently their focus was elsewhere. Barker began working on his solo album, ‘Give The Drummer Some’, Hoppus toyed with a solo project of his own, and following a tragic plane crash in which Barker survived, Blink-182 returned and in turn resulted in +44 and their second album being put on an extended hiatus. Through accidentally pioneering the crabcore genre, Ohio’s Attack Attack! had a pretty rough ride from a big portion of the metalcore community and music industry in their early years, though they managed to rake in their respect towards the end of their career. Following vocalist Caleb Shomo‘s departure in 2012 to eventually form Beartooth, they recruited Phil Druyor to pick up microphone duties, and with this renewed line-up they released a new song called ‘No Defeat’ (which you can listen to here). The track was expected to feature on their fourth record, and the band shared some videos of them working in the studio putting it together (which can still be seen here). It was then meant to be released under the band’s new short lived named of Nativ before their eventual split, but sadly it never came to fruition. Prior the release of their fifth album ‘Saturday Night Wrist’ in 2006, Deftones and their relationships with one another were beginning to deteriorate pretty rapidly, to the point where there were considerations that they would break up and go their separate ways. Before heading out on tour to promote the record, a meeting was held between the band and management to talk things out and, thankfully, differences were reconciled and, with a new sense of reinvigoration and passion for their craft, they soon began work on its follow-up, ‘Eros’, a record which frontman Chino Moreno has described as “unorthodox and aggressive”. Sadly, things took a serious turn for the worse on November 4th 2008 when bassist Chi Cheng was involved a serious traffic collision that left him in a coma. The band made the decision to put the recording of ‘Eros’ on hold, instead recruiting Sergio Vega (Quicksand) whilst he recovered to help them create something new and more optimistic, resulting in the release of ‘Diamond Eyes’ in 2010. Tragically, on April 13th 2013, Cheng died of a sudden cardiac arrest whilst being treated in hospital and, on the one year anniversary of his death, Moreno uploaded the track ‘Smile’ online (listen here) – to date the only track from the album to date that’s been released officially. Since it being shelved in 2009, the band have expressed mixed feelings about completing and releasing it. ‘One By One’, the fourth studio album from rock giants Foo Fighters, and arguably one of the biggest in their catalogue with singles like ‘All My Life’ and ‘Times Like These’, almost never came to be. Prior to first recording and producing the intended follow-up to 1999’s ‘There Is Nothing Left To Lose’, the band faced a few set backs. During the demoing sessions, drummer Taylor Hawkins suffered from a heroin overdose which left him in a coma for two days, and the band took some further time off when Dave Grohl agreed to drum for Queens Of The Stone Age on their album, ‘Songs For The Deaf’. Sessions resumed once again in October 2001, and by January 2002 they headed into the studio to begin putting the 29 songs they had at the time onto tape, one of which included ‘The One’. It cost them approximately $1,000,000 and, at the end of it, the band openly expressed how unhappy they were with the material. Instead of continuing on with a record that they were unhappy with, which to this date has only been jokingly referred to as “million-dollar demos” by Hawkins, the band decided to redo the album from scratch during a two-week period at Grohl‘s home studio, resulting in what we know today as ‘One By One’. Back in 2002, Green Day were working hard on ‘Cigarettes And Valentines’, a record which they hoped would instil some of their faster and more punk rock fuelled early works as opposed to their more versatile past two albums, ‘Warning’ and ‘Nimrod’. Yet, before they could complete the recording of the album, the master tapes were mysteriously stolen from the studio. The material was eventually relocated and recovered, but instead of re-recording the album once again, the trio instead opted to work on something entirely different. The band soon began piecing together what would become ‘American Idiot’, a punk rock opera and concept album which saw Green Day soar to heights and successes that surprisingly dwarfed that of their 1994 breakthrough, ‘Dookie’. Unsurprisingly, the band have since referred to the unfortunate theft of ‘Cigarettes And Valentines’ as a “blessing in disguise”. Over the years, the band have reportedly used parts of those recordings into new songs that they’ve released since ‘American Idiot’ hit stores, though there are no known plans to officially release ‘Cigarettes And Valentines’ as a whole body of work as originally planned. Across all of his projects (Glassjaw, Color Film), Daryl Palumbo has definitely created a reputation that art cannot be rushed, and Head Automatica is no exception to the rule. Formed as a more pop driven outlet from the emotional aggression of Glassjaw, the quartet saw notable success pretty quickly with their 2004 debut single, ‘Beating Heart Baby’, and their two records ‘Decadence’ and ‘Popaganda’ were pumped out just a couple of years after one another. 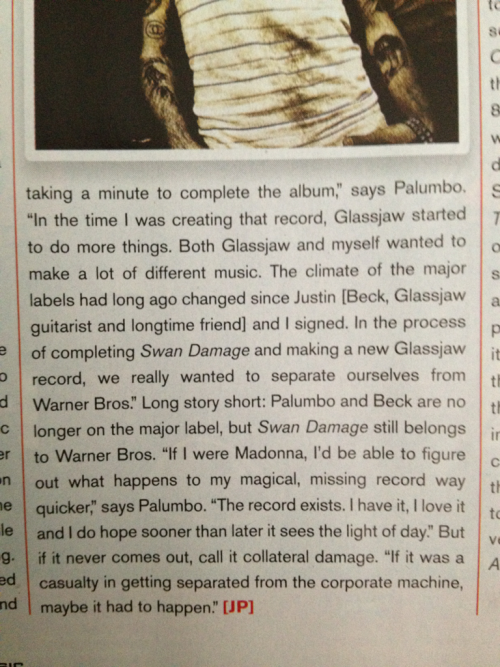 It’s album number three, however, that has suffered from the Palumbo release lag that Glassjaw‘s third LP ‘Material Control’ only managed to bust through at the tail-end of 2017. Head Automatica began work on their third record, ‘Swan Damage’, in 2007 and in 2009, the vocalist confirmed in a tweet (here) that it was recorded and ready to be mixed. Since then, we’ve heard very little more about ‘Swan Damage’. Reportedly, this is due to now former label Warner Bros. Records shelving it and legally preventing it from being released (here), and maybe it never will, but for now some fan-shot live performances of its songs like ‘Cute Police’ (here) and ‘End Of Heat’ (here) can be found online. The status of ‘Stampede Of The Disco Elephants’, the sixth record from nu-metal godfathers Limp Bizkit and follow-up to 2011’s ‘Gold Cobra’, is a bit of a weird one to say the least, but let’s take a stab at it. In 2012, the band signed to the hip-hop label Cash Money Records, who they remained with until 2014. During that time the band released a total of four singles, including ‘Ready To Go’ which features rapper Lil Wayne (you can hear it here), all of which are assumed to feature on the yet-to-be-released album, though that hasn’t been officially confirmed. Since then, the production and release of ‘Stampede Of The Disco Elephants’ has been far from a stampede and more of a stand still. Frontman Fred Durst claimed in 2017 that it’d already been secretly available for a over year on file-sharing site Soulseek, though no-one has found it, and in 2018, Bring Me The Horizon‘s Oli Sykes and Jordan Fish said they were pulled in to help write with the band, eventually using a turned down riff for their own single, ‘Wonderful Life’. As of 2019, the latest is that Durst and Wes Borland are slowly piecing a record together. It might be ‘Stampede Of The Disco Elephants’, which could be on Soulseek, or it might be renamed or a different album entirely. In short, only Limp Bizkit know. In 1980, New Jersey punk rockers The Misfits began piecing together what would’ve been there debut full-length album, ’12 Hits From Hell’. Some line-up adjustments led to most of it being scrapped, instead only using three tracks from the sessions on the similarly titled 1981 EP, ‘3 Hits From Hell’. Over the years since, the odd song here and there was cut, mixed, and chucked onto a compilation album or two, but it wasn’t until 2001 that the record was very nearly released. Promotional copies of the record were sent out to the band and some critics, but due to several concerns raised by vocalist Glenn Danzig and bassist Jerry Only, further production and release scheduling was ceased completely, and, at least right now, there are no plans to change that. Ever since their split in 2013, My Chemical Romance fans have nearly really fully gotten over and finished mourning what was once. To this day, the New Jersey outfit are still very much adored and influencing legions of acts that have spawned since. Following the release cycle of fourth album ‘Danger Days: The True Lives Of The Fabulous Killjoys’ and the subsequent ‘Conventional Weapons’ compilation, the band had officially brought in touring keyboardist James Dewees as a full-time member and began working on album number five. Only a few months later, in March 2013, the band announced their unexpected split, and only one song intended for ‘The Paper Kingdom’ was released, called ‘Fake Your Death’, which appeared on their greatest hits record, ‘May Death Never Stop You’. Carrying a title that sarcastically acknowledged their simple but effective song structure, ‘Verse Chorus Verse’ was a live album that had been in works for half a decade, intended to be a compilation of live performances from the grunge icons Nirvana. Understandably, with its creation being in motion just months after the death of frontman Kurt Cobain, surviving members Dave Grohl and Krist Novoselic were struggling with helping putting it together whilst also emotionally coping with the loss of their friend and bandmate, which in part resulted in the record not coming to be. Apparently, what spurred the label wanting to release ‘Verse Chorus Verse’ was the circulating bootlegs of their then unreleased MTV Unplugged performance, which was originally meant to be released as one part of the compilation, but was later released on its own. The other half would’ve been recordings from throughout their career of other live performances, which instead was substituted for the eventual release of 1996’s ‘From The Muddy Banks Of The Wishkah’. As far as debut albums go, few have exploded into the scene quite like Panic! At The Disco‘s ‘A Fever You Can’t Sweat Out’. The Las Vegas outfit swiftly moved from MySpace up-and-comers to a pop-rock favourites, and in turn left a lot of pressure for its follow-up. The band headed to a secluded cabin in the mountains of Mount Charleston, Nevada in early 2007 to start putting together their second album, which was apparently following in a similar vein to its predecessor, and they proceeded to perform some of the new cuts live that summer. Soon after, they returned to their old studio, scrapped the full record almost entirely, and started anew with what would become ‘Pretty. Odd.’. The only song from the originally recorded and scrapped album (referred to as ‘Cricket & Clover’) that made the cut for ‘Pretty. Odd.’ was its lead single, ‘Nine In The Afternoon’, though another then unused song ‘Nearly Witches’ would later feature on their third album, ‘Vices & Virtues’. As a general rule, supergroups tend to have a short survival rate and their releases tend to be very hit-or-miss affairs. As for Tapeworm, well, sadly it was a project that was never able to get off of the ground at all. The group was predominantly spearheaded by Trent Reznor (Nine Inch Nails), but over its existence through 1995 to 2004 also featured collaborations from the likes of Maynard Keenan (Tool, A Perfect Circle), Atticus Ross (12 Rounds, Nine Inch Nails), Page Hamilton (Helmet), Phil Anselmo (Pantera, Down), and more. Sadly, despite reportedly having an album with of material ready to mix, Tapeworm never did release any material at all, and in 2004 Reznor officially confirmed that the project had been put aside completely, citing label issues, commitments from other members, and his dissolving interest in the material created. Another supergroup that came to be in the 2000s was Velvet Revolver, which in its inception was composed of Slash, Duff McKagan, and Matt Sorum of Guns N’ Roses, guitarist Dave Kushner, and vocalist Scott Weiland of Stone Temple Pilots. After releasing two full-length records, 2004’s ‘Contraband’ and 2007’s ‘Libertad’, tensions began to arise between Weiland and the other members, resulting in the frontman being fired from the group in 2008, and auditions being held for his replacement soon after. A handful of vocalists from other established bands tried out for the position, including Myles Kennedy (Alter Bridge), Lenny Kravitz, and Chester Bennington (Linkin Park). Corey Taylor (Slipknot, Stone Sour) also auditioned, and recorded approximately ten new songs with the band, though he wasn’t offered the position in the end. Tragically, though Weiland very briefly returned to the group for a one-off set with them in 2012, he was found dead in December 2015. There have been no further releases from Velvet Revolver since ‘Libertad’, including the album’s worth of recordings with Taylor, or any other auditioning vocalists. Californian rockers Weezer were initially intending to go pretty bold early on with the follow-up to their self-titled 1994 debut, also commonly referred to as ‘The Blue Album’. Their plan was to release a science fiction rock opera, complete with six characters voiced by members of the band. Titled ‘Songs From The Black Hole’, the record would’ve expressed frontman Rivers Cuomo‘s mixed feelings about rock ‘n’ roll success, yet following his enrolment at Harvard University, his songwriting style changed, and with that he decided to scrap the album and work on something new. That turned out to be ‘Pinkerton’, which certainly wasn’t a bad replacement all things considered, and, though most of ‘Songs From The Black Hole’ didn’t make it past its initial sessions, both ‘I Just Threw Out The Love Of My Dreams’ and ‘Devotion’ did become b-sides. Even before the disbanding of Rage Against The Machine in 2000, frontman Zack de la Rocha had been working away with a handful of collaborators on a planned solo album, eventually working with Trent Reznor (Nine Inch Nails) with whom he reportedly produced around 20 songs. Though Reznor spoke very positively about the songs that they worked on together, de la Rocha‘s feelings on the material were much less so, ultimately confessing that he feels that he just wasn’t “ready to make a record” at that time. Eventually, in 2004, one of his collaborations with Reznor called ‘We Want It All’ featured on the soundtrack album ‘Songs And Artists That Inspired Fahrenheit 9/11’, with the odd guest appearances on the songs other artists in between. In 2016, the news broke that de la Rocha had a new album worth of material ready to go, along with the release of a new song called ‘Digging For Windows’, and that his debut solo record would eventually see the light of day in early 2017. However, in 2019, we’re still waiting for it to drop. NEWS: Green Day might drop a new album in 2019! NEWS: Green Day’s UK fans plan to get ‘American Idiot’ to #1 for Trump’s visit!